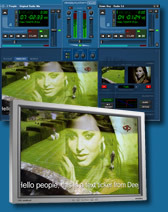 Deejaysystem™ is a series of digital audio and video mixer software applications designed to cover the needs of professional discjockeys/videojockeys during live or automated mixing sessions. Deejaysystem™ players are a plain, precise and reliable emulation of real DJ-CD/DVD players, but also including mixing capabilities and many handy features. Nicolas Vignot has kindly translated the Deejaysystem manual into French. The manual is now available in spanish, french and partially english. The recommended codec pack for Deejaysystem video has been updated to K-Lite Codec Pack version 9.95. These codecs seem to provide the best compatibility and performance with most formats in Deejaysystem Video. Windows 7 / 8 compatibility. New MIDI controllers supported: Denon MC-2000, Hercules MP3 e2, Pioneer CDJ-400, Reloop Digital Jockey IE2, M-Audio X-Session Pro. Support for lots of new audio and video formats. Karaoke files are now natively supported. Search filters for audio / video / karaoke. We are moving Deejaysystem.com to a new server. The forum will be closed for maintenance during the next days until the procedure is completed. All other sections, contact, support, store, etc. will keep working normally. The K-Lite Codec Pack Deejaysystem Edition has been upgraded to the K-Lite 7.70 version. This includes support for most today's video formats including HD video. The new codec pack also includes support for Apple video formats, so the old QuickTime pack is no longer required and has been removed from the download page. Download the new codec pack here. The troubleshooting page has also been updated. Deejaysystem VJ2 3.5.0 Beta 4 has been upgraded to include some files that were missing in the first release. These files provide the support for the external MIDI controllers, so they will work again after re-downloading and re-installing Beta 4.Also, support for Hercules DJ Control MP3 e2 has been included. Your software out performs any other system on the market. I'm always looking for the best video drivers and system on the market... I always come back to DJ System! Simply the best for mobile VJs! Id like to say a big thank you for your deejaysystem software as it was the only dj system i found that did the job.Its an easy and reliable system for any dj across the world.Took me about 1 seconds to get the hang of it.Its really that simple.I have been using it for over a year now and i havnt had one problem with it.Fantastic!! I'd like to commend you for the wonderful service that you provided, and your dedication to make it work. Many software providers wouldn't provide such wonderful service for a single club having problems. [...] You were kind enough to take your personal time to help me work out what the problem was, and I applaud you for this. Your DJ software will forever be a staple at all the clubs that I own/manage/DJ at. Why choose Deejaysystem instead of another player? I need a simple reliable good quality player for my DJ activity's. I work with the denon MKII with CD's and I want to switch over to PC. I tested a lot of software's, but this is the best. because it is the only program that has neverfailed my friend, ever. Most intuitive to use player I could find; contained the feature set I needed. DJS has once again, proven to be the BEST "REAL DJ" software in the world!